I’m laying in bed right now, trying to desperately turn off my active mind. It’s nearly impossible to do. As April 1st comes to a close, i’m already struggling to come to terms with this month and the ignorance i’ve already encountered. Twitter is the place to go when you desire controversy and i’m no stranger to that. I reside in British Columbia and we are synonymous with the NHL team, The Vancouver Canucks. Many people find them to be a source of pride and optimism, even to go so far as to say they represent Vancouver. 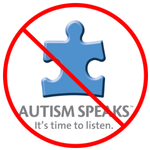 I believed that for a long time until I became aware of the Canucks Autism Network. It’s a great thing to want to support Autistic people but it’s another thing to utilize the puzzle piece and incorporate material sourced from Autism Speaks. They also use strange language like “families with autism” in their marketing materials. I feel like the #1 resource for those who organize these events and create the foundation for these networks and charities should be an Autistic person or even a group of Autistic people. To me, that simply is common sense. The way these events are structured, there is a strong emphasis on family and children. A lot of the time Autistic adults are left out and not even considered. It’s as if they believe Autistic adults don’t exist. Hello! We’re here. We exist. We have opinions, thoughts, feelings that we would love to share with you. We’re human too! Awareness leads to acceptance, no? I was at the Canucks game Saturday and it felt like a great night for kids/adults in crowd/on ice. And the headline infers "families with kids with autism," so I guess that's more accurate but now we're splitting hairs. Thanks for the feedback. I also saw that they are working with Microsoft’s Vancouver Office. For a while, I wanted to reach out and collaborate with Microsoft and I couldn’t even find a viable way to contact the right department. I was given a telephone number, I tried to exhaust internal contacts and I couldn’t get to the right person. I wonder if it’s purposely inaccessible? Microsoft has a program to hire Autistic people and yet the company is virtually unreachable. Between Canucks Autism Network, Autism Support BC and Surf’s Up For Autism, amongst many others, we continue to be coloured blue and puzzled. I feel as though they don’t know the negative connotations or simply don’t care. If you want to help us, ask us. Put it out there on twitter. Have a focus group with Autistic people of different ages. ASK US FIRST. If you’re running a contest with a colouring page for Autism, hire an Autistic artist. I’m so excited to announce that Kim’s Convenience is BACK for Season 3! I think as a collective whole, we can agree that the wait has been long but good things come to those who wait and I can assure you it’s good, really good. I want to thank CBC for giving me the chance to watch the first episode, aptly titled “New Appa-liance”. I honestly don’t want to give too much of the plot away. What I can tell you is it starts with a fart and ends with a dishwasher. Janet’s has her struggles in her photography program and grapples with her name. There are some wonderful moments with Jung and Appa. Umma is a bit more emotional in this episode, but I find she has good reason. If you haven’t watched the show and you’re looking for laughs, you can catch up on previous episodes on CBC Gem & Netflix. Premieres on CBC January 8th at 8/8:30NT. Read my previous article about the play & meeting Paul Sun-Hyung Lee here. Sensory Matters PODCAST & Going VIRAL! Happy New Years Eve everybody. I’ve had a pretty eventful past few days. Firstly, I submitted a WINNING ENTRY to No Frills – which is a budget friendly grocery chain here in Canada owned by Loblaws (Galen Weston). I came up with a catchy, tongue-in-cheek melodic jingle and it’s going viral. It’s nearing 100,000 views. Check it out right here! Also, Sensory Matters was kind enough to interview me for their podcast and it went live today. I hope you have an amazing 2019! I want to thank the Vancouver Park Board for giving me the chance to attend this beautiful event. The Bloedel Floral Conservatory first opened it’s doors in 1969 and has been delighting families ever since. It had been an especially long time since I had been – probably over 15 years! I was in awe of the plants and the birds! The gorgeous lights that have been added to make holiday heights come to life. We were warmly greeted and asked if we wanted to participate in the scavenger hunt. OF COURSE. No hesitation. Find all the GNOMES?! YES! In case you didn’t know, I love garden gnomes. I think it has to do with my fascination of all things kitsch. The birds are stunning and wonderful to see. For me, it evokes memories of my past. I grew up in a house full of pets. One of them was Arthur. Arthur was a blue and gold macaw who absolutely loved my mom. They were inseparable. Arthur now lives at the conservatory and I stopped by and talked to him. I could tell that he remembered me. He was family, after all. We approached a photo wall, complete with hashtag and beautiful flowers. Couldn’t help but snap some shots! Insta-worthy moment. I noticed that some of the trees had very eclectic decorations. Shells and other kinds of natural wonder adorning them. Things like this please me because they give me artistic ideas and I love the fact that they are so unique. Thanks for reading and have the happiest of holidays! I have been enjoying a lot of hot chocolate and teas while frantically entering Christmas contests. It’s that time of year again and it happens to be one of my most enjoyable hobbies. Seriously. I do this…! I did some more background work on film where I was dressed up all 80s and it was WILD. I didn’t realize my hair could get that big. I have been thinking of some articles i would like to write so i’m just kind of waiting for that BURST of creativity to hit me so I can get it done. I haven’t neglected my blog. I always fear people are going to think i’ve abandoned it. That’s just not the case. The fact that people believe that LGBTQ2+ is a completely separate issue from being autistic blows my mind. You can’t rally for one group and marginalize the other. -How I feel about this whole Laurie Guerra issue and the comments here. Laurie Guerra, Director of AUTISMBC spoke out at an ANTI-SOGI Event. She is a bigot. To deny the rights of the LGBTQ2+ Community and work at a place where you are promoting inclusion and diversity and then turn around and make hateful comments is not acceptable. UPDATE: I spoke up against Laurie on twitter and she blocked me. If this is how she handles things–with ignorance leading the way, she does not deserve to be in a place of power in any sense of the word. According to this website, Laurie makes over 400,000 annually. It must be nice to make that kind of money and not have to worry about the consequences of hateful, homophobic speeches. I’m honestly not sure if my microphone even worked, it was plugged in.. Hopefully the sound is okay for my viewers!